The Healthcare Data and Analytics Association (HDAA) is a volunteer organization comprised of over two thousand of the Healthcare Industry’s leading Data and Analytics professionals from over 400 leading healthcare providers including Mayo Clinic, Cleveland Clinic, Kaiser Permanente, Geisinger, Intermountain Healthcare, Providence, Mercy, Baptist Health, Catholic Health, Adventist Health, MD Anderson, Mt. Sinai, Sutter Health, Henry Ford, UPMC, Universities like Stanford, Harvard, Yale, Northwestern, Baylor, Penn State, Duke, University of Utah, Michigan, Wisconsin, Florida, Illinois, Maine, etc. 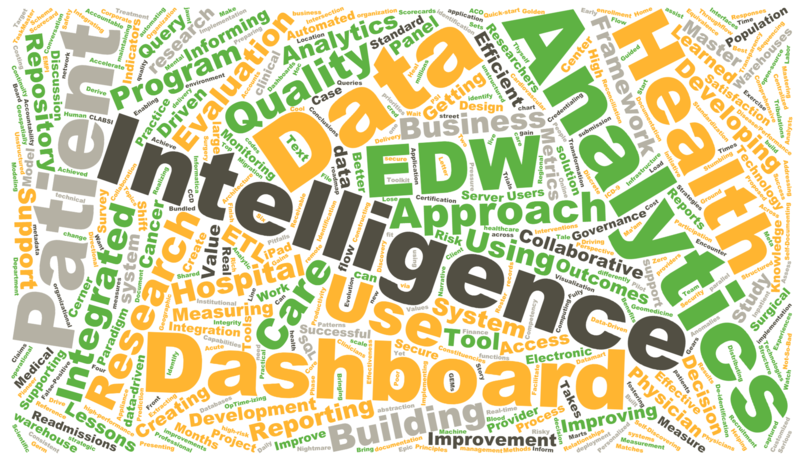 Analytics from leading EMR vendors like Epic, Cerner, etc. Managing data from ICU devices, consumer wearables, genomic data, claims data, socioeconomic data, unstructured data in clinical notes, patient reported data, etc. Gain access to years of materials from the healthcare industry's leading data and analytics professionals. Ask any data and analytics question and get an answer same day (to same week) from other data and analytics professionals. The following are illustrative topics from past HDAA presentations. As a member you can search through years of presentation materials to find both the content you are interested in and the people who made the presentations. There is NO COST to join HDAA. HDAA is a completely volunteer organization.The entire organization is funded through revenue from our annual conferences. This is an exceptional healthcare data and analytics organization where you can get answers to your data and analytics questions, share lessons learned with other industry professionals, get first hand validation of data and analytics vendors claims and accelerate your adoption of data and analytics to produce better healthcare outcomes and cost improvements for your healthcare system. Please join this valuable group and consider joining us for our annual conference. NOTE: HDAA membership is not open to vendors and consultants. Click on the link below to see full HDAA membership criteria. HDAA is not liable and does not accept any legal responsibility for any error or omission that may be in any posting.